During the aluminum casting process, the metal melt is either poured or pressed into the mold. This process is used, for example, to manufacture cylinder heads, wheel rims and many other aluminum castings. Here, the mold has to repeatedly withstand the metal melt at a temperature of over 600 °C: for inserts made of our tungsten-heavy metal alloy Densimet® and the molybdenum alloy TZM, that's not a problem. 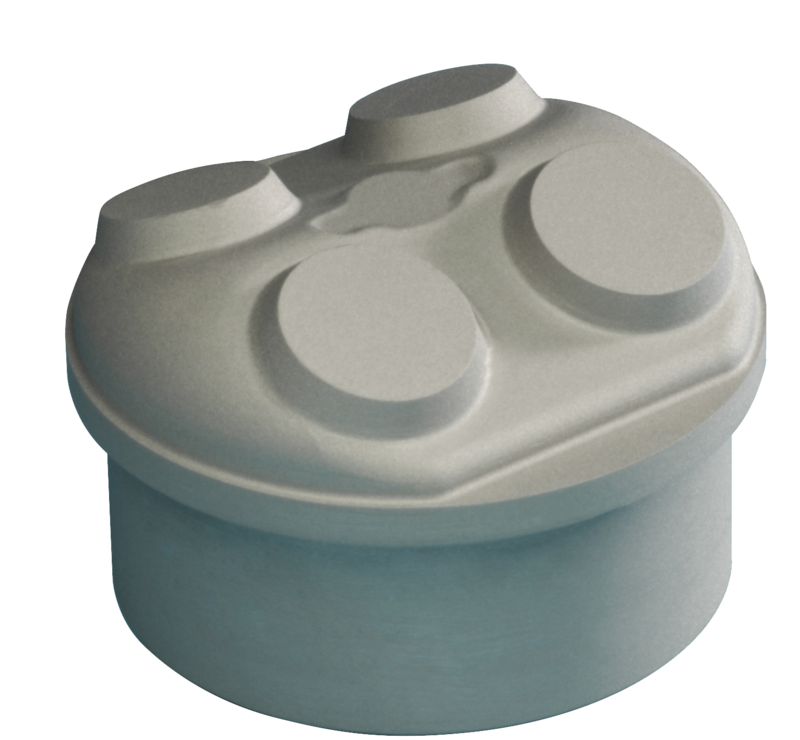 We supply tailor-made mold inserts, sprue bushes, cooling inserts and other individual parts as well as semi-finished products for your mold. Why traditional molds have difficulties. Steel molds are susceptible to corrosion, erosion and adhesion of the aluminum to the surface when molten aluminum flows over the surface of the mold. If the ferriferous material dissolves in the aluminum melt, or if the steel is eroded by high flow rates, the surface of the mold gradually wears. Frequent temperature cycles also subject tools and components to stress during metal casting: Variations in temperature distribution and different coefficients of thermal expansion lead to thermal stress. 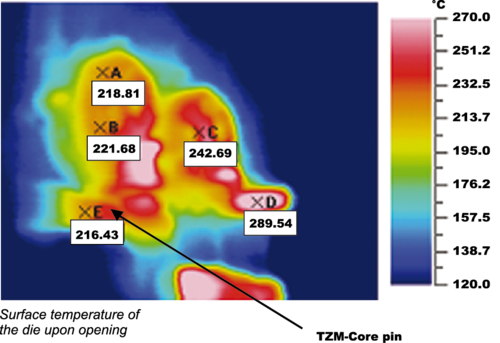 Cracks and distortion resulting from thermal fatigue can cause complete failure of the component. The ideal material for molds used for aluminum casting thus has to meet the very highest mechanical, thermophysical, chemical and tribological requirements. Traditional hot working steels using alloy additives such as chromium and molybdenum do not live up to expectations. So what can be done? Anyone wishing to save money and increase productivity in the aluminum casting process should use top-quality materials for the molds, which take the brunt of the wear and tear. The properties that are needed are chemical resistance against metal melts, high thermal conductivity and good high-temperature stability. Our materials for aluminum casting. Molybdenum and tungsten are what are known as refractory metals, i.e. metals with a melting point greater than 1700 °C. Molybdenum melts at 2610 °C and tungsten only melts at 3407 °C. They both have a low coefficient of thermal expansion of around a third that of steel. Their thermal conductivity, on the other hand, is around four times greater than that of 1.2343 steel. The high modulus of elasticity of 360 GPa to approx. 385 GPa guarantees ample rigidity even at high temperatures. The mechanical properties of molybdenum and tungsten depend on their level of cold working, their purity and their level of recrystallization. Stability at room temperature is below that of tempered hot working steels. At 650 °C, stability is comparable to that of hot working steel. The physical properties of TZM differ very little from those of pure molybdenum. But small quantities of extremely fine carbides make TZM more resilient than pure molybdenum and give it a higher recrystallization temperature and greater creep resistance. Tungsten alloys D2M and D185. Pure tungsten is extremely difficult to machine and very brittle at low temperatures. In mold-making, tungsten is therefore only used in composite materials. 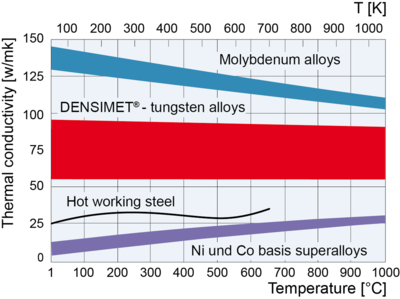 In combination with iron and nickel, or iron, nickel and molybdenum, we get Densimet®, which is our two-phase material comprising a binder phase with embedded tungsten particles. Iron, nickel and molybdenum make the tungsten material far easier to machine than pure tungsten. 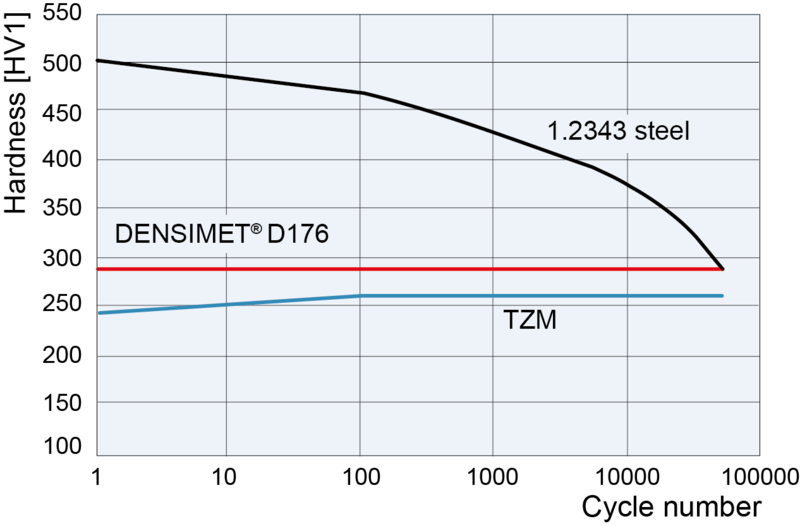 Our Densimet® materials contain up to 97% tungsten. We primarily manufacture our inserts for aluminum casting from Densimet® 185 (D185) and Densimet® D2M. 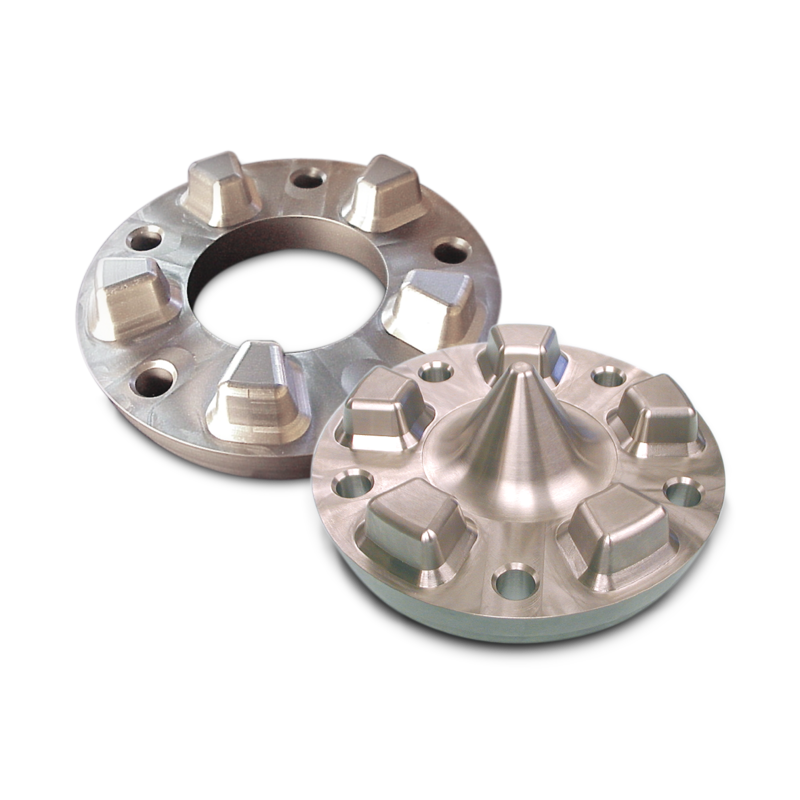 Due to its greater mechanical strength, our customers mostly use D2M for high-pressure casting applications. Its particularly good thermal conductivity means that D185 is predominantly used in gravity and low-pressure casting applications to ensure optimum temperature distribution in the mold. We would be delighted to advise you and find the right material for your application. Densimet® WR: Getting the most out of your mold. 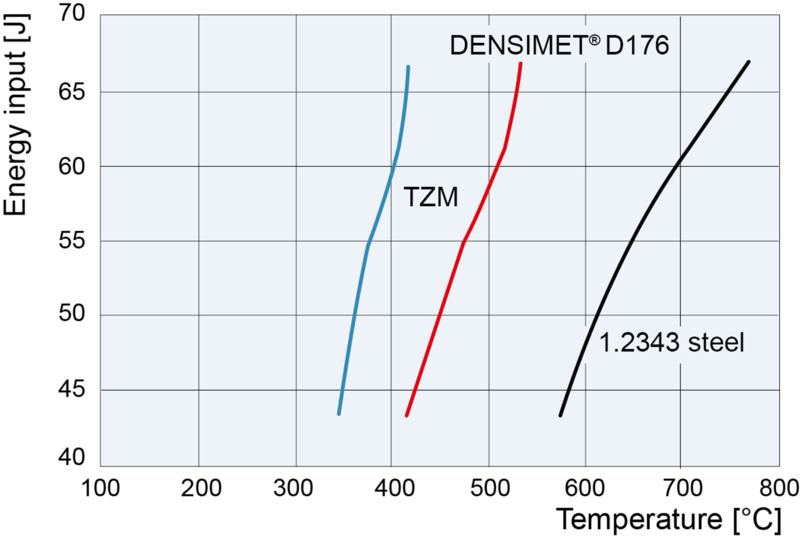 If you notice any erosion or washed-out areas of the material of our Densimet® molds after they have been in use for a long time, that's not a problem: Build-up welding with our Densimet® WR welding electrodes enables you to repair the affected areas and extend the life of your mold for many more cycles. We supply rods of Densimet® WR in a variety of lengths and diameters - to meet your exact requirements. Rapid heat dissipation. Short cycle times. 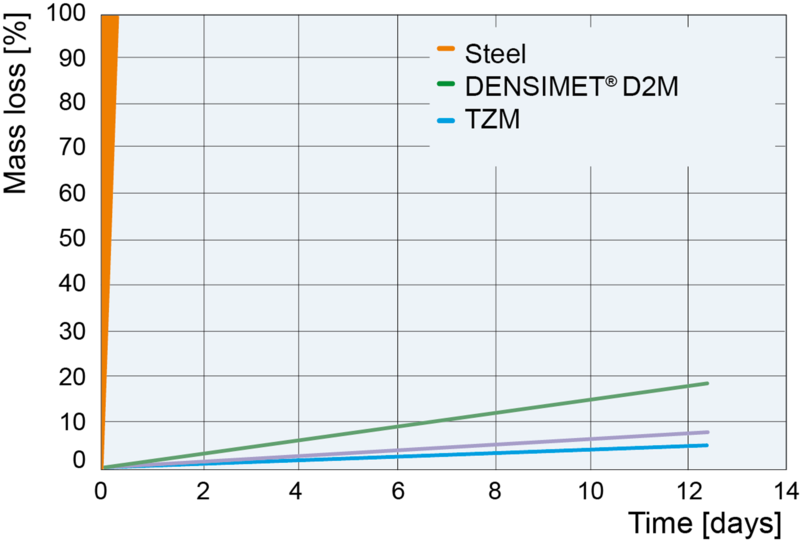 The thermal conductivity of our tungsten-heavy metal alloy Densimet® and the molybdenum alloy TZM is up to four times greater than that of conventional steel. The benefit to you: At critical locations, the mold cools down significantly faster and you can perform more casting cycles in a shorter time. In addition, thanks to the rapid heat dissipation, the microstructure (dendrite arm spacing) of the aluminum castings is significantly finer. 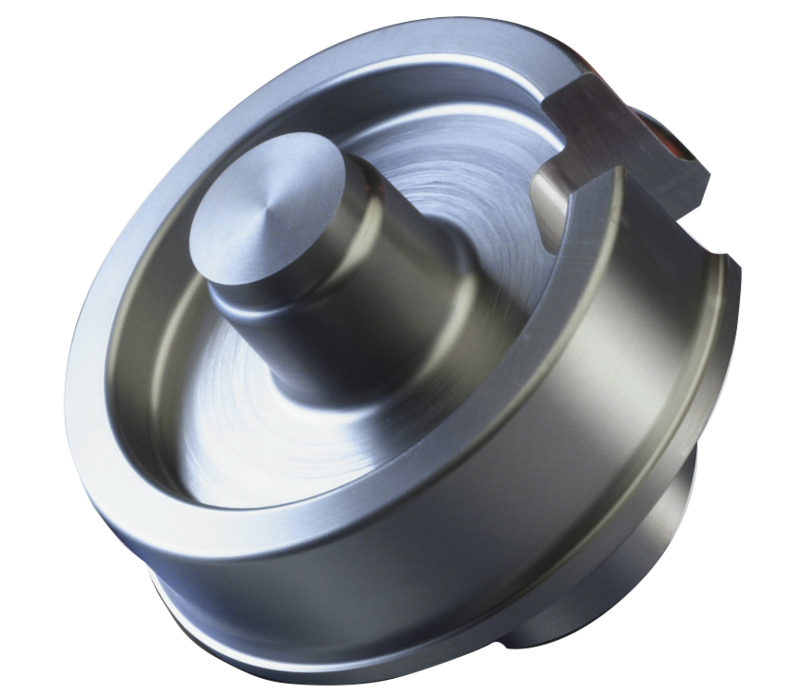 This in turn helps optimize the mechanical properties of your products, for example by increasing their strength. The high thermal conductivity of molybdenum and tungsten allows heat to be dissipated rapidly, thus ensuring a low temperature difference between the surface of the mold insert and the core of the casting. 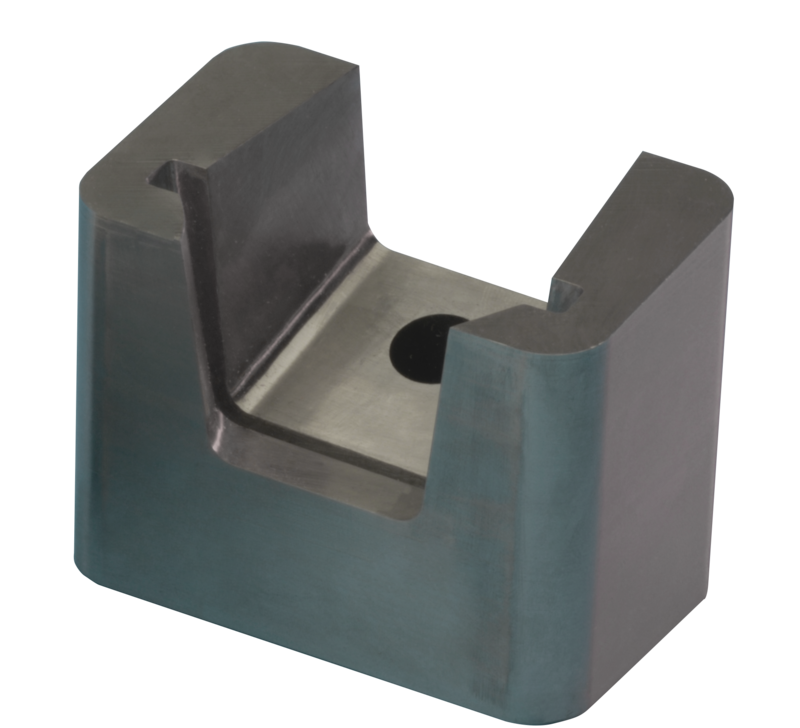 Given the same energy input, the surface temperature of our mold inserts is significantly lower than that of steel. In combination with the high thermal conductivity of Densimet®, this means that there is no danger of cracks forming in the mold insert during the casting process. Because the aluminum melts come into contact with the colder surface of the mold insert during casting, thermal fatigue cracks often form in the material. This can cause networks of cracks in the mold, in particular during high-pressure casting. 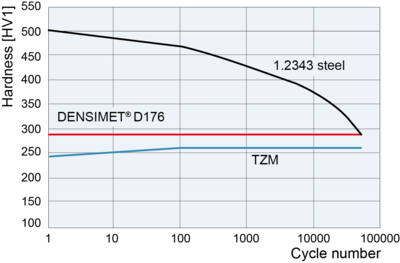 The coefficient of thermal expansion of Densimet® and TZM is a third lower than that of steel and avoids thermal fatigue cracking in the mold. The surface hardness of hot working steel molds begins to lessen after a certain number of casting operations. In the case of refractory metals, on the other hand, no reduction in hardness is observed, although they start from a lower strength level. Because it is not possible to harden molybdenum and tungsten with traditional heat treatment methods, a protective coating can be applied to the finished component. Traditional PVD coatings such as CrC or TiAl are suitable for this purpose. We also offer our own wear-resistant coating that increases surface hardness to more than 1000 HV without having any impact on the corrosion resistance of the material. Interested? Just contact us! Traditional mold inserts and cores are particularly susceptible to erosion when aluminum is injected at high speeds. Molybdenum and tungsten do not dissolve in an aluminum melt. 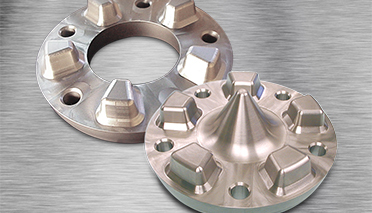 Mold inserts made from Densimet® and TZM are particularly resistant to erosion and corrosion. Because our material does not react with the aluminum melt, no metal residues continue to adhere to the mold insert, for example when the castings are removed. The benefit to you: The inserts can be used for longer, do not have to undergo time-consuming cleaning operations and are soon ready for the next pouring. Goodbye casting defects. Hello molybdenum and tungsten. If the aluminum melt does not harden evenly, this often results in casting defects such as cavities and porosity. This tends to happen primarily in areas where the wall thickness varies. This can be avoided with targeted heat dissipation. Tungsten and molybdenum alloys dissipate heat four times more efficiently than hot working steel and cool the aluminum casting precisely where the material is intended to harden faster. In many cases, this makes it possible to avoid casting defects and dispenses with the need for complex additional cooling. The good thermal conductivity properties of molybdenum and tungsten alloys also speed up your processes. Significantly higher cooling potential = faster cycle times. 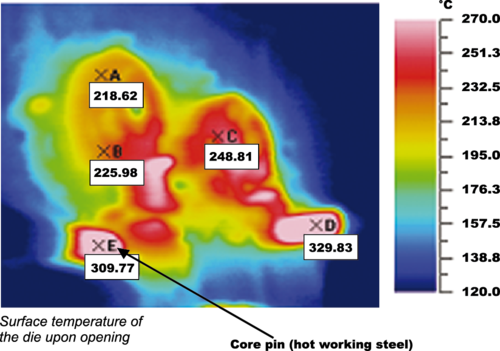 Thermal image of a mold after opening. Steel cores at positions D and E.
Thermal image of a mold after opening. TZM cores at positions D and E.
The very best of recommendations. 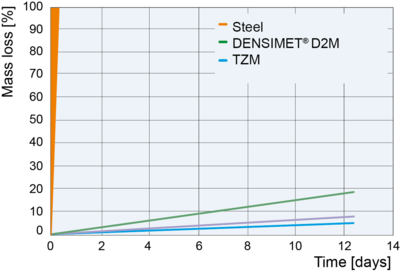 Densimet® is machined in much the same way as hot working steel. But please take note of our machining recommendations in the tables below. Molybdenum materials can also be machined well. They nevertheless have certain properties that need to be taken account of during machining. Please follow our guidelines. 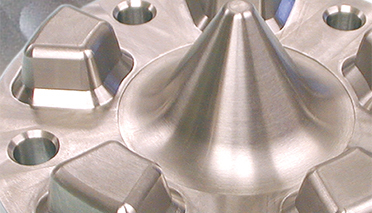 For machining molybdenum, we recommend hard metal tools with positive cutting geometry from Ceratizit. You can achieve complex shapes and perforations by spark erosion. In this process, the molybdenum or tungsten alloy acts as the anode and the working electrode acts as the cathode. We recommend our Sparkal® electrodes as the electrode material for spark erosion. <a href="en/products/components/forming-and-machining-tools/erosion-electrodes.html" title="Sparkal® electrodes">Sparkal® elektrodes. Oxidation: In air or any oxygenous atmosphere at temperatures up to 400 °C, oxidation of molybdenum is negligible. At temperatures above 600 °C severe oxidation or sublimation takes place. 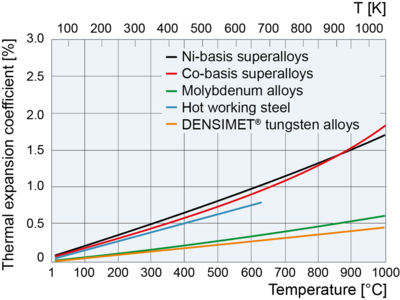 Oxidation: Densimet® tungsten alloys start oxidizing slightly as of 600 °C. However, experience in the casting industry shows that no problems arise. The temperature of the mold when it is opened is somewhere between 400 °C and 500 °C and commonly applied coatings offer additional protection. When the mold is filled, the melt displaces the atmosphere, thus preventing oxidation. Components such as thermowells which are simultaneously exposed to the melt and to oxygenous atmospheres will generally need to be protected against oxidation. High-temperature infiltration, liquid phase sintering and back-casting are all used to produce high-performance composite materials with outstanding properties. Our competence center – Plansee Composite Materials – combines such diverse material properties as density, corrosion resistance, thermal conductivity and thermal expansion, temperature resistance and mechanical stability during the development of its composites. 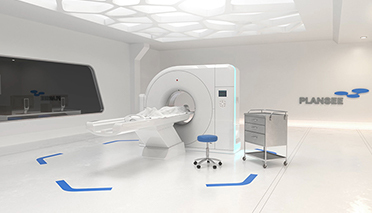 We work in close collaboration with our customers in the foundry, medical technology, automotive and other industries to turn their ideas into reality. Join them and contact us!